Well, it's Rishie's Birthday today!!! Yohoooooooo! Can't believe our first baby has reached 5 years ya! He was the first joy in our married life...he brought lots n lots of happiness to us! The moments of delivering him stays fresh in our memories...such a cutie baby...Thank God! Today, he's a much grown up boy...joined kindergarten at Smart Reader Kids since 20th May'09! Yeah, actual plan was to register him next year for one-year kindie only...but since he was so interested to go to school, he managed to change his Papa's mind...hehehe! That's y he joined late. But before that, he always reads at home...we bought him lots of books...so do his granny from Puchong...she bought him lots of books too, thank you! Now, being a Smart Readers Kid...Rishie became much wiser too...hehex! So proud he was able to catch up with their lessons. He's got lots of praises from his dear Teachers too. Some mornings, his class Teacher (Mrs Lee) would have something to say about him to me...so do the other teachers... The most common word they would tell me about him is...Self-Independent! They always say Rishie is a very independent boy...does everything himself...does not disturb the teachers at all and he catches up with the lesson very quick too..ahakz! 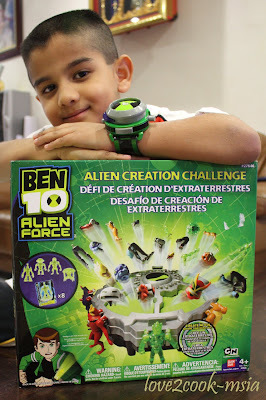 Since my hubby had to leave for Brazil last nite...he bought Rishie his fav Ben10 Omnitrix Illuminator and Ben10 Alien Creation Challenge as his Birthday gifts! Rishie got the gifts just before dear Papa left from home around 930pm. 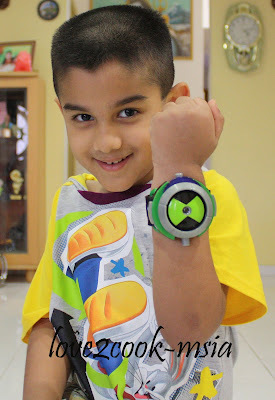 I'm unable to explain how happy Rishie was when Papa gave him that! 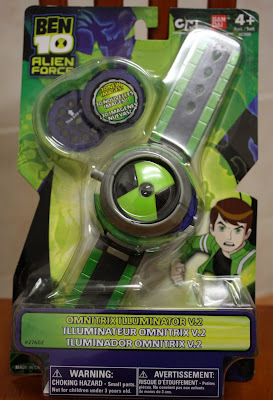 He just ran around saying "It's Hero Time"! Usually the kindie celebrates every kids birthday, but today would be their photography session day and it'll be a long day for them, so the Teachers suggested we celebrate it on the 10th which would be their last day of school for this year...and also their Party day! So all-in-one! Rishie is not aware of this celebration yet as we kept it secret from him! I wanna give him a surprise when I go there with his cake! Sayang betul dear Hubby couldn't be around for the party! semoga Rishe menjadi anak yang baik baik...dan membanggakan kedua ibu bapa dimasa depan nanti..
i'm feeling that both rishie's and ashika's birthdays are near to each other. is that true? 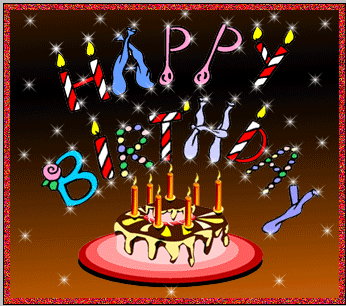 Happy Birthday Dearest Rishie.....You are such a grown up young man now! With an additional responsibility to take care of mummy & baby sister Ashika....wow ...what a job!!! Anyway Auntie Watie knows that you are ABLE to do it....keep up with the good attitude in school...and you will be successful throughout your life!!! PSSST....LOVE....I know how proud of you....I have been in that same spot almost 15 years ago...since my eldest will be celebrating his 20th Birthday...this January...bertambah tua...rasanya...MAMA ni!!! 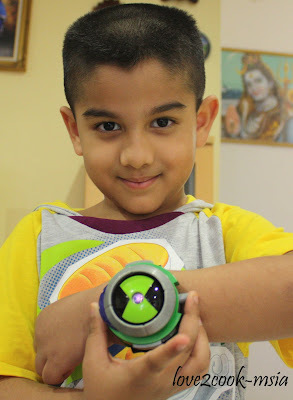 Happy 5th Birthday to Rishie...Haiyooo dah handsome macam Rishie Kapoor laaa..really!! May you bring happiness and joyful to your Amma, Appa and baby Ashika...may sucess will be along with you always! What a wonderful gift he got...! epi besdayyy ensem boyy!! 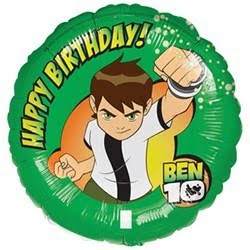 nih klu nmpk anak2 akak kompom dier mintak jugak ben 10 tuh! hihihi sama minat! happy 5th bday Rishie!! stay cool n stay handsome always!!! give my kiss n hug to a besday boy for me ya..
Aunty Nor ~~> Tenkiu so much for the wishes Aunty Nor! Hehex...from Rishie! Aunty Ijan ~~> Tenkiu for wishing me tee! Will ask my Mummy to post my cake cutting pics...hehex! from Rishie! Aunty Nur ~~> Hi tee! Tenkiu so much for the song! I'll take care of my family, when my Papa at work! hihi...from Rishie! Aunty Sha ~~> Hi tee! Tenkiu for the wishes! from Rishie! Aunty Ida@Sunkist ~~> Hi Tee! Thought u've forgotten me! Tenkiu for wishing me ya! :) from Rishie! 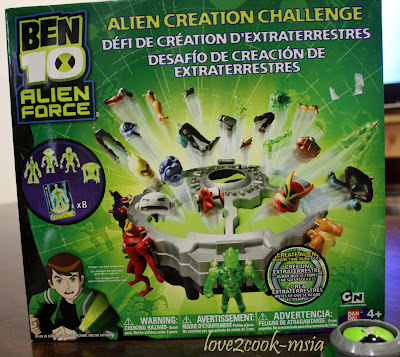 Dear Papa bought me my fav Ben10, so happy know!